« Kids Learn To Code – For Free! The answer to 3=? is 6, I believe. The next number is six, as it goes down in order of multiplication, so 4 would be multiplied by 3, and 3 by 2. Viewed another way, each number is multiplied by the whole number directly below it. 3*3=9 is it wright? Am I right? How about 9? Unless there is another pattern I’m not seeing…. The answer is 3=6 . and now I need to put some extra words in because a single letter comment isn’t accepted by this web engine. there, that should be enough text. Just to make sure, I’ll add a nice big signature. That should do it. 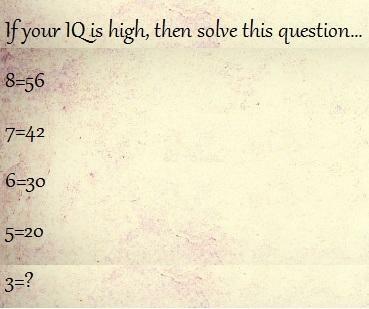 Following the sequence given, I think the answer is 6…if it’s not a trick question.